There’s no getting away from it, University is a big investment. As a student at Sunderland, we understand the pressures of balancing your daily finances with your studies. We’re here to support you with your finances in every possible way, and we offer generous grants, including cash bursaries, reduced tuition fees, free accommodation and free public transport. You’ll find every available scholarship on this page to make your life easier, so you can focus on what’s important – pursuing your career ambitions. You don't need to apply for these scholarships - if you're eligible you'll receive them automatically. * Subject to University tuition fees remaining at their current level (January 2019). StudyPlus is a personal fund for each Year 1 student to spend on study essentials and textbooks in the University’s StudyPlus online store. Students on the Integrated Foundation Year will receive £200 of funds plus a bundle of study skills books worth £80. Other first year undergraduate students will receive £150 of funds. All first-year home, EU and international undergraduate students starting in 2019 on a University of Sunderland course in Year 1. Higher Degree Apprenticeship, PGCE, Masters and PHD levels, and programmes delivered at our Partners Colleges, are not eligible for this scholarship. 20% off the course fee to reward loyal alumni who return to study a full or part-time postgraduate degree at the University of Sunderland. Home/EU alumni get a cashback payment in either February or June (see terms for details) and international students receive their discount upfront. Alumni (graduates of the University) who enrol on a masters-level postgraduate course (MA, MSc, LLM, MBA, PhD - excluding PGCE’s) delivered at our Sunderland campus starting in Sep/Oct 2019 and Jan/Feb 2020. A cash scholarship in both year 1 and year 2 of study worth £1,000. For Full-time Home and EU undergraduates who achieve 128 UCAS points from a maximum of three level 3 qualifications. Medicine MBChB are NOT eligible for this scholarship. Free travel across Tyne and Wear for a year, or an accommodation discount on University-managed accommodation (including The Forge U Student Village). For January start programmes, the ticket is valid from January 2020 to September 2020. Full-time Home and EU undergraduates. For students of compulsory Foreign Languages Study Abroad and Modern Foreign Languages (MFL) in Education with Qualified Teacher Status (QTS). For Home/EU University of Sunderland Foundation Degree students studying at partner colleges who progress to an on-campus top-up year. A cash £2,000 scholarship - £1,000 in Year 1 and £1,000 in Year 2 of study. Full-time home Medicine MBChB students beginning their programmes in academic year 2019/20. Free University-managed accommodation in Scotia Quay for Year 1 of study and a discount of 50% on University-managed accommodation in Year 2. Supported travel costs for Medicine students in Year 3 (placement year) in recognition of the increased costs incurred during placement. What it is: StudyPlus Card with offers up to the value of £200 plus a bundle of study skills books worth £80. £1,250 cash-back in the first and final year of the full-undergraduate course. Who it's for: Full-time Home/EU undergraduate students starting in autumn 2019 on a University of Sunderland Integrated Foundation Year programme. To receive these scholarships, you will need to apply for them. The University of Sunderland scholarship is open to 2018/19 students joining in spring 2019. For full-time home/EU students with an annual household income of less or equal to £42,875*. Application deadline: 25 April 2019. This scholarship is strictly limited in numbers of scholarship awards made. *This information was correct at the time of publication, however, the Government is currently discussing future maintenance loan levels; once any changes have been announced and formalised we will update our website accordingly. Applicants for BA (Hons) Broadcast Media Production or BA (Hons) Broadcast Journalism. Please note that this scholarship is awarded by the Royal Television Society, not the University of Sunderland. For Full-Time Home/EU students with an annual household income of less or equal to £42,875*. This scholarship is strictly limited in numbers of scholarship awards made. £1,500 cash scholarship for each year of study (including placement year) for care experienced students or family estranged students. For Full-Time Home Undergraduate and Postgraduate students under the age of 25 on 1 September 2019. Up to £1,500 of support for Medicine students in Year 5 to prepare for their clinical placement. 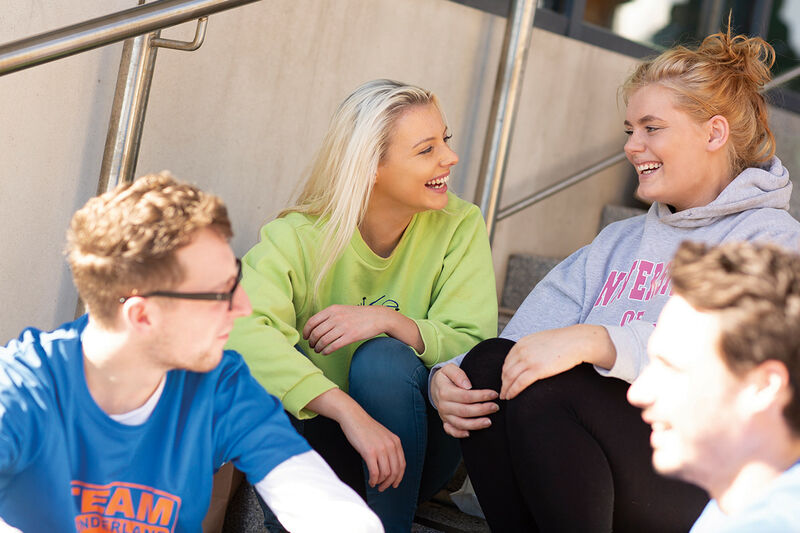 £1,000 cash for TWELVE Medicine students in Year 1 of study who make the University of Sunderland Medicine programme their firm choice by 31 May 2019 and meet at least one of the Widening Participation priority awarding criteria. This scholarship is strictly limited in number of scholarship awards made. An additional discretionary fund to support retention and progression for full-time students from care or those estranged from their families who need additional support. Full-time undergraduate students studying a discipline related to Engineering, Education, Enterprise or Business who are at the end of their penultimate year (second year for a standard programme or third year for a four-year programme) and on track for a first or 2:1. Students must hail from the immediate Sunderland area and demonstrate financial need. Masters level students in Glass, Ceramics, Photography, Curating or Fine Art. Students must have a firm offer and meet specific scholarship criteria. Students studying BA Glass and Ceramics (stage 2 and 3), MA Glass, MA Ceramics, PhD Glass and Ceramics. Awarded to allow students to undertake a project or opportunity that will lead to innovative uses of glass or ceramics for creative use. The Government offers several grants that don’t need to be paid back to help with the costs of Higher Education.